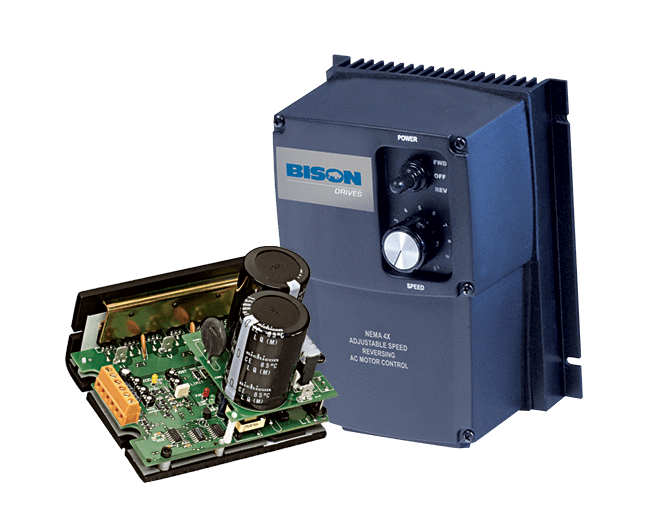 Bison’s variable frequency Drives feature a lightweight, plastic NEMA 4X enclosure, an isolated front end, minimum speed adjustment potentiometer (pot), output voltage doubling, DC injection braking, and automatic or manual restart when power is restored. NEMA 4x enclosure: Compact, easy to mount, black plastic enclosure. User adjustable calibration pots: Minimum speed, maximum speed, current limit, acceleration, deceleration, slip compensation, boost, zero set, brake current, and brake time. Adjustable 4 to 16 kHz switching frequency; Quiet motor operation or reduced electrical noise. Quick Disconnect terminal block: Allows up to 200% torque to overcome intermittent peak loads. Additional features: Auto or manual restart after low input voltage fault (jumper selectable), line fusing, enable and direction inputs.